The Frostpoint/Dewpoint indicator detects and indicates the frostpoint or dewpoint of a gas sampled from a high pressure air system, from 3,000 to 5,000 psig. 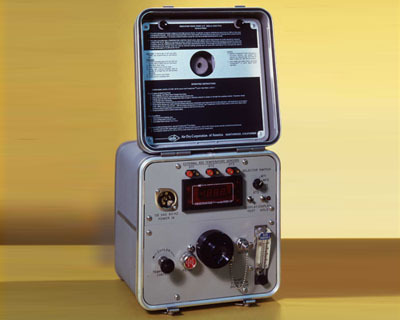 The indicator, called the Frostpointer, is housed in a rugged, portable unit carried to the test site and connected to a gas source by a sampling hose. (Supplied with the frost pointer). To establish the frostpoint/dewpoint, the sample gases cooled by an internal “cryostat" cooling system. The resulting frost or dew is viewed through a unique, patented optical and oblique lighting system. The corresponding frost or dew point is then read from the digital meter on the front panel. The frostpointer provides complete control of both volume and cool-down rate of sample gas over the chilled mirror surface. The frost pointer can also measure temperatures from one to three remote sources connected to terminals on the front panel. Merely use the selector switch to choose a terminal set, and read the remote temperature on the digital meter. Used on US Navy surface ships and submarines for dry air measurements. Used in metrology and industrial laboratories to establish measurement parameters. Registered on the Qualified Parts List (QPL) : and NSN 685-00- 919- 4710. Meets the requirements of MIL-I-24144 (SH) Shock tested per MIL-S-901 Vibration tested to MIL-STD-167. Operating pressure range: sample gas 2800 to 5000 psig. Frostpoint/Dewpoint range:-70°F (-56.7°C) to 50°F (10°C) at an accuracy ±5F (±2.78C) over the temperature range. Cooling Rate: -60°F within five minutes (with 3000 psig) using a dependable “cryostat” cooling system. Front panel digital readout with holding features.